It’s a common trope in pop culture, often misquoted from a line in the 1989 baseball film Field of Dreams. That was also the mantra that Grapevine Powersports owner Aaron McWhorter believed in wholeheartedly when he purchased the dealership in 2015. The experienced businessman — who spent 25 years in the automobile industry and at one point owned nine different businesses with his wife, Luane — saw a lot of opportunity in the dealership when he visited it as a customer. The potential profit was there, but the customer service and products the dealership offered were lacking. “I walked into the store to buy a four-wheeler, and when I walked out the door I bought the dealership,” McWhorter told Powersports Business. When he finalized the deal to purchase the dealership, located near the Dallas/Forth Worth airport in Grapevine, Texas, it was a Kawasaki-only dealership that had five employees and about $3.3 million in annual revenue. According to McWhorter, last year revenue grew nearly three-fold from the first year of operation, and they now have 27 employees. It’s all led to Grapevine Powersports being selected as a Powersports Business Power 50 dealership in both 2016 and 2017. While some dealerships are struggling to stay afloat in the transforming powersports industry, Grapevine Powersports is nearly struggling to maintain inventory. McWhorter can’t control industry trends, but he has helped Grapevine Powersports succeeded by focusing on what he can control — customer service and stocking the right inventory. 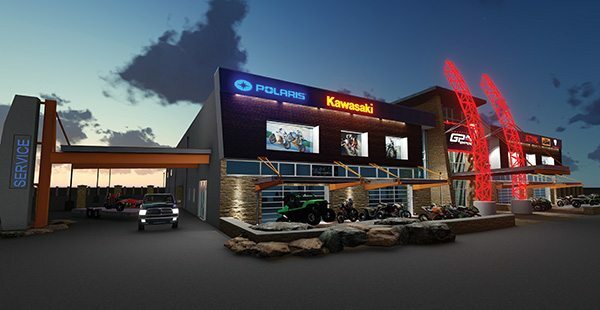 Grapevine Powersports sells vehicles from Polaris (including Slingshot), Kawasaki and KTM. Plans for the future include the addition of CFMOTO. McWhorter said that at the moment the store’s 6,000-square-foot showroom floor is so jam-packed with units that there’s no room for pre-owned inventory. As a cattle ranch owner, McWhorter has personal insight into the wants and needs of his customer base, many of whom are farmers and ranchers. Of course, they also sell plenty of motorcycles, too — last year the dealership was the top Kawasaki sport bike dealer in the state. He also increased Grapevine’s aftermarket accessories sales exponentially, through stocking the right products and selling them at the point of purchase. This emphasis on having a variety of accessories and products has led to the dealership bringing in 12 times the revenue in P&A than it did last year. As Grapevine Powersports has grown its sales by significant margins across the board, it’s surprising to learn that of the store’s 27 employees, only three are dedicated sales people. The dealership needs so few dedicated sales staffers because, according to McWhorter, every employee can — and is expected to — sell units, if and when the situation calls for it. “Everyone sells units — it doesn’t matter what department you’re in, if something needs doing they do it. We had a guy come in who was looking at a KTM and my shop foreman is a master KTM tech. The customer and I went and grabbed him out of the shop and they talked for an hour-and-a-half and he made the sale,” McWhorter added. This model has been so successful for Grapevine Powersports that the business has long outgrown its current location near the Dallas/Forth Worth International Airport. To manage this massive growth, McWhorter just broke ground on a new $6 million dollar facility, 1.5 miles away from the current dealership. At eight acres, the new property will be six times the size of the old store. The expansion will allow Grapevine to consolidate its inventory, which is now located in three separate warehouses. Beyond the showroom floor, the service department will triple in size, and more space will be allotted to the parts department as well. Outside the new building, a large parking lot and awnings will allow units to be displayed in car dealership fashion, while a two-acre test track will convert door swings to sales. A massive TV screen will welcome customers to the showroom floor. 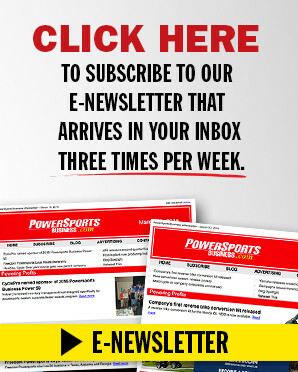 When Grapevine Powersports move into the new space, the dealership will offer complimentary products for its customer base, including as firearms and STIHL power cutting tools. In addition, McWhorter is going to start a rental company, which will start by offering around 30 Kawasaki Mules, STIHL products and trailers. The goal is for the dealership and rental company to complement one another. For example, customers who purchase an extended warranty or prepaid maintenance when buying a unit will receive a free rental when servicing their purchase at the dealership takes more than a few days. 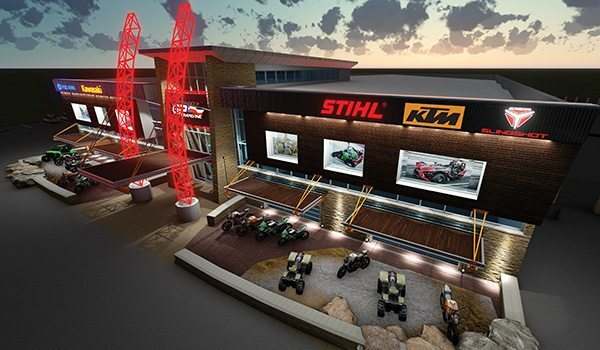 Grapevine Powersports’ new building will feature large garage doors on the front façade and awnings to better display units. its new space, Grapevine Powersports will maintain its steadfast attention to detail in taking care of the customer across all departments. The service department, already functioning at a technician efficiency rate of 86 percent, will have over three times the number of service bays, as well as a wash bay, to better service its customers. McWhorter said that they will add a few more technicians when the new location opens. Grapevine Powersports has grown exponentially in the three years under McWhorter’s ownership. According to McWhoter, there’s no secret to the dealership’s success — it’s just paying attention to the little things and caring for the customer. “We pay attention to every detail, not just the big ones — the big ones take care of themselves if you pay attention to every small detail,” McWhorter said.